Food is the centre of our lives. For Bangladeshis it is the core of all functions, the highlight of weddings, the joy of any celebration, and the reward for attending a religious ceremony. There is no doubt that we take our food very seriously. 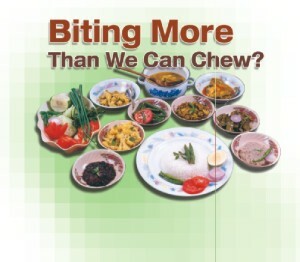 But are we thinking about what we eat as opposed to what our taste buds crave for? Not really, at least not very often. Which is why we are wreaking havoc with our bodies. A typically Bangali diet is supposed to be fairly healthy consisting of all the essentials that nutritionists recommend--plenty of fish, loads of veggies, basketful of fruits. Ok, lets not disillusion ourselves any further. Let's face it, we no longer consume a typically Bangali diet. The Bangladeshi diet is a mish mash of traditional Bangali cuisine to which we have added Mughlai, continental, oriental and who knows what recipes. This includes the whole gamut of fast food-- burgers, fries, fried chicken and so on. Add to this our inexplicable affinity for inactivity, our weakness for the lazy good life and we are treading on the territory of ill health, diabetes, heart disease, arthritis and obesity. So where are we really going wrong and is there a way out of this vicious cycle of eat, eat and eat till you drop dead?